Disclosure: I was not financially compensated for this post. I received a sample of the product for review purposes. The opinions are my own, based on my personal experience with the product. This post contains affiliate links. I’ve been trying a lot of subscription boxes lately. I like the convenience of them, the opportunity they give to try new products, and the pure fun of getting them in the mail. I’ve had some great experiences with boxes that revolve around food and boxes that deliver fun things for my kids, but I hadn’t experienced a box made just for me until I received the opportunity to review FabFitFun. * Kai Perfume Oil – this fragrance is made with essential oils in a convenient roll-on vial. I love the summery smell of this fragrance. The vial is a great size to throw in your make-up bag or your little evening bag. This perfume oil retails for $48. 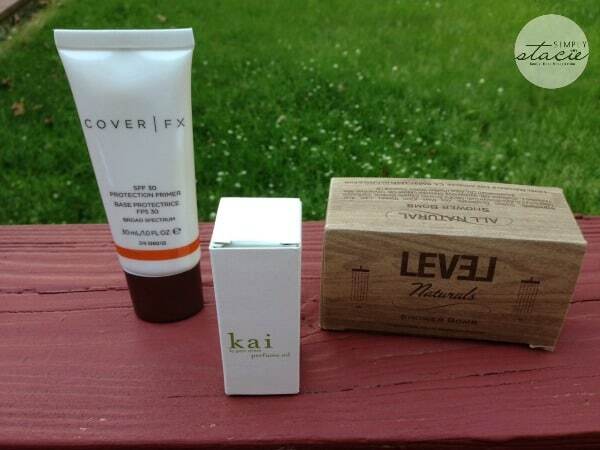 * Cover FX SPF 30 Primer – this is one of my favorite items in the box. This water-resistant SPF formula protects, hydrates, and smooths skin while extending makeup wear. With my fair skin I never like to leave the house without some sun protection, and this primer is lightweight and seriously silky smooth. It literally glided over my skin. It’s also a product you can feel good about using – it’s paraben-free, fragrance-free, gluten-free, mineral oil-free, and talc-free. This primer retails for $38. 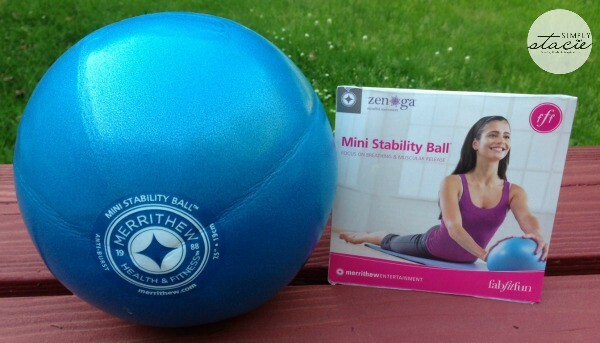 * Merrithew Mini Stability Ball and DVD – this DVD focuses on breathing techniques and mobility of the spine, hips, and shoulders. The aim is to improve posture, relieve negative tension, and strengthen your core. I like that it’s a low-impact workout with a low level of difficulty – so you don’t need to be a workout-pro to benefit from these exercises. It comes with a straw for easy inflation, and the ball is anti-burst. The retail value of the ball and DVD is $28.94. * Dermasuri Deep Exfoliating Mitt – I exfoliate all year long, but I’m more diligent about it in the spring and summer when I’m showing more skin! This mitt helps you smooth your skin surface, improve circulation, stimulate collagen, fight aging, reduce ingrown hairs, even your skin tone, rejuvenate your skin, and help your body absorb skin care products more effectively. This mitt retails for $19.99. * Cult Gaia Turband – this is a hybrid of a headband and a turban, with a wire that helps it keep it’s shape and structure. I found it to be comfortable to wear and I love the cherry pattern – very springy! This item retails for $48. * Oscar Blandi Pronto Dry Shampoo Invisible Spray – I have never used dry shampoo before, but I’ve been reading a lot about it lately as it seems to be quite trendy. This spray is clear (ideal for all hair colors) and has gentle starches that absorb excess oil, while Vitamin E and wheat proteins strengthen and protect your hair. This would be great to have on hand while camping or if you know you’ll be unable to wash your hair for a few days. This bottle retails for $25. * Level Naturals Shower Bombs – I’ve heard of bath bombs before, but this was my first experience with a shower bomb. The smell of the organic menthol and eucalyptus is heavenly (even just in the package!). All you have to do is place one bomb in the shower and let the hot water and steam work its magic. This is a very relaxing way to end the day. At just $7.99 for a 4-pack, these bombs are a steal. * The Better Chip Spinach and Kale with Sea Salt – I shared these with my husband as he too is a kale chip fan. His words to describe these chips: “absolutely fantastic!”. Besides being so tasty, these chips are non-GMO verified and gluten free and a great guilt-free snack. This bag of yum sells for $1.99. All of these products have a grand total of $217.91 – way beyond the $49 price tag of the box. I love that all the items in the box are full-size, and that each product really serves a purpose of helping you feel better and look better. I really felt like every item was personally picked for me – with care and thought about what I put in and on my body. There’s also a product info card included in the box that outlines exactly what each product is and how to best use them. I would absolutely recommend this subscription box for woman of all ages. On the FabFitFun FAQ page I was able to check out what has been in previous boxes, and I have to say, I was very impressed – sunglasses, scarves, make-up, games, snacks, skin care products, and more. This is really a fun subscription service, and worth every penny! You can choose a quarterly subscription in which you’ll be billed $49.99 per box, or you can choose an annual subscription where you prepay $179.99 for a year worth of boxes, saving $20 off the quarterly subscription. You can also give a gift subscription – I know I would love to receive this as a gift! Simply Stacie readers will receive $5 off a Summer 2014 box by using the code simplystacie at checkout. You can find FabFitFun on Facebook, Twitter, Pinterest, and Instagram. I think this is the best subscription box I have seen yet. 0I would love to try the Better Chip Spinach and Kale with Sea Salt. I have never heard of such a subscription box before. They are always food or beauty boxes and this one sounds wonderful. I could never afford it but I’d love to receive it as a gift as well! As usual you have come up with something wonderful to share with us. THANK YOU STACIE! Nice to see a fitness box, love the stability ball, I think I would use that the most. This seems like such a fun program. Love that they give you SPF face cream as well as healthy snacks and workout products! This is awesome I want one!! This is such a nice fitness box to enjoy and have after working and to use when working out. I like the Perfume and the stability ball. This sounds very interesting to me! Thanks for the review and the introduction! I’ve read about other subscription boxes before, and how some buyers were very displeased with the contest of the box. This one is a steal of a deal. This looks like a really good subscription box. Usually when I see subscription box reviews there are always a few items that I wound not want or use but I would definitely use all of the items in this box. Thank you for sharing this review. This is a great box. Thank you so much for sharing. I’ve never heard of these before they sound great. Thanks for the review.